As previously noted, during the early 1700s western Virginia was an inhospitable wilderness fraught with danger from wolves, bears, and other men. There were no courts, so the early settlers were not under any obligation to obey the law. For example, according to local legend, John Simpson got into an argument with a Mr. Cottrill over a peck of salt. Cottrill's lifeless body was discovered outside Simpson's cabin. Cottrill's gun, which was found near Simpson's barn, was said to have been cocked and ready to fire. Simpson, the main suspect in the murder, was never tried for the crime. Without an established court system, "frontier justice" was the only law that prevailed. 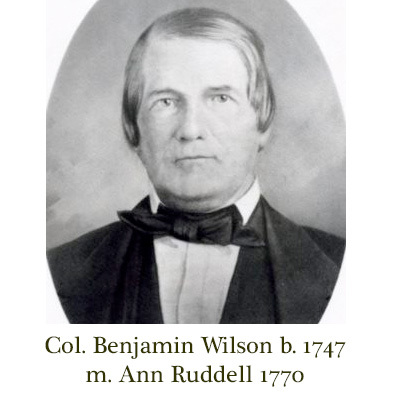 Colonel Benjamin Wilson, an avid Indian fighter and local politician, was one of Randolph and Harrison County's more notable citizens. He was born in Frederick County, now Shenandoah County, Virginia, on November 30, 1747. His parents moved to Trout Run, near the South Branch of the Potomac, then in Frederick and now in Hardy County, when he was a small boy. In 1770, he married Ann Ruddell and moved to Tygart Valley, in Randolph County. In 1774, he was attached as a Lieutenant to Lord Dunmore's army, and later served as Lord Dunmore's personal aid during what was to become known as Lord Dunmore's War. Lord Dunmore's War began after some settlers in the northern panhandle killed several members of Mingo Indian Chief Logan's family. Logan revenged the killings by killing several frontier settlers. The Shawnee, and other Indian tribes residing in the area, upset over the increasing number of European settlers infringing upon their territory, allied themselves with the Mingo and began to attack various settlements throughout the state. The Governor of Virginia, John Murray, the Earl of Dunmore, and General Andrew Lewis raised an army and devised a strategy to end the uprising. General Lewis was to march his portion of the army northwest through Virginia and drive the Indians westward, while Lord Dunmore marched his portion of the army across the Alleghenies and down the Ohio River, trapping the Indians between the two forces. During the war, General Lewis led the colonial militia to victory over the Shawnee and their charismatic leader Chief Cornstalk at the Battle of Point Pleasant on October 10, 1774. In the meanwhile, Lord Dunmore led troops into Ohio where he encountered the retreating Cornstalk, forcing him to sue for peace. Although western Virginia's settlers continued to experience some isolated Indian attacks for several years, Cornstalk's defeat at Point Pleasant was the beginning of the end of the Indian presence in western Virginia. The Indians agreed to give up all of their white prisoners, restore all captured horses and other property, and not to hunt south of the Ohio River. Also, they were to allow boats on the Ohio River and promised not to harass them. This opened up present-day West Virginia and Kentucky for settlement. Cornstalk was later killed at Fort Randolph near Point Pleasant in 1777 in retaliation for the death of a militiaman who was killed by an Indian. Benjamin Wilson later served during the American Revolutionary War where he was promoted to Captain. After the war, he served as the commander of the local militia and was promoted, in 1781, to the rank of Colonel. He also served in the state legislature for several terms. In 1784, he was instrumental in the organization of Harrison County from Monongalia County and was named Harrison County's first county clerk. He held the position for thirty years. In 1788, he moved to Clarksburg when his land in the Tygart Valley was incorporated into the newly formed Randolph County. Around this time, he bought 400 acres along Simpson Creek, and built several mills there. He died in 1827, at the ripe old age of eighty. During his lifetime, he fathered twenty-nine children, twelve with Ann Ruddell and eighteen with Phoebe Davisson, whom he married in 1795, following Ann's death. His youngest child was born when he was seventy-three years old. Colonel George Jackson, and his son, Brigadier General John George Jackson, are two more significant figures in Harrison County's history. Born in Cecil County Maryland in 1757, Colonel George Jackson moved with his parents to Moorefield, and, in 1769, to Jackson's Fort (now Buckhannon). He was promoted to the rank of Colonel during the American Revolutionary War. After the war, in 1784, he moved to Clarksburg to be closer to his newly constructed mill. While in Clarksburg, he was accepted into the County Bar without any formal legal training and practiced law. He was one of several leading citizens in the area who actively lobbied the Virginia General Assembly to create Harrison County, arguing that the county seat in Morgantown was too far away for the efficient conduct of business. When Harrison County was formed in 1785, the first county seat was located at Colonel Jackson's home on the Buckhannon River. Colonel Jackson was elected to the state House of Delegates in 1784, serving from 1785 to 1791, and from 1794 to 1795. He was a member of the state convention which ratified the United States Constitution in 1788; and was elected as a Republican to the U.S. House of Representatives in 1794, serving from 1795 to 1797 and from 1799 to 1803. In 1806, he moved to Zanesville, Ohio and was subsequently elected to the Ohio state House of Representatives (1809-1812) and the Ohio state Senate (1817-1819). He died in Zanesville, Ohio on May 17, 1831. His son, Brigadier General John George Jackson, was born in Buckhannon September 22, 1777 and moved with his parents to Clarksburg in 1784. He served as a member of the Virginia House of Delegates from 1798 to 1801 and was elected to his father's seat in the U.S. House of Representatives, serving from 1803 to 1810, left to serve in the War of 1812, and then returned to the House, serving from 1813 to 1817. In 1819, he was appointed United States district judge for the western district of Virginia and served in that capacity until his death in Clarksburg on March 28, 1825. In 1787, the Virginia General Assembly voted to establish Randolph Academy in Clarksburg, the first Academy created west of the Appalachian Mountains. Although the school was chartered in 1787, it was not actually built until 1793. Two important figures in the school's history include the school's first instructor, George Towers, an Oxford educated Presbyterian Minister, and Francis Pierpont, who served as Governor of the Restored Government of Virginia during the Civil War. Pierpont was later instrumental in the creation of the state of West Virginia. The original trustees of Randolph Academy included John Powers, Colonel Benjamin Wilson, George Jackson, and Nicholas Carpenter. 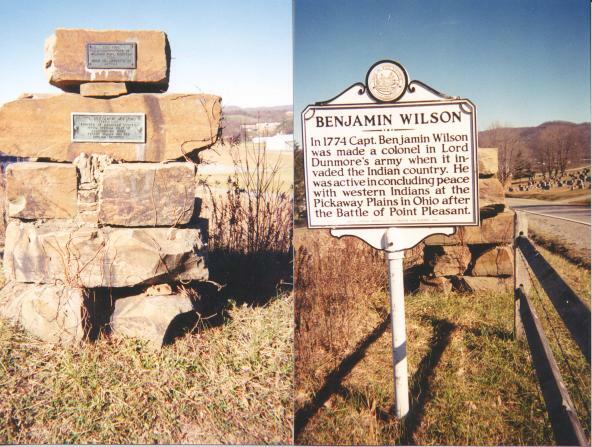 William and Elizabeth's son, Benjamin was born 11/30/1747 in Frederick Co. VA and died 12/2/1827 near Clarksburg, Harrison Co. VA.
Benjamin has been described as the premier Indian fighter west of the Alleghenies. Chronicles of Border Warfare has a number of references of Benjamin raising a company to track Indians who had attacked frontier settlements. He was a close friend of George Washington and Captain Isaac Ruddle. He also served as a delegate to the Virginia Constitution Congress in Richmond in 1788. Somehow between his military excursions, Benjamin found the time to father twelve children by Ann Ruddell, daughter of Stephen and Mary Bird Ruddell, whom he married in 1770. After her death, he married Phoebe Davisson in 1795. They had eighteen children.